Who does not love a good sketchbook? I am particularly interested in learning how artists use preparatory sketches to inform their studio paintings. I first became aware of the work of Rory McEwen when I read this blog post on Katherine Tyrell’s Making a Mark blog. Then by coincidence a dear friend of mine gave me this monograph of his work, and all I can say is that I often lose an hour or more when I open this book because I spend so much time looking at each plate. Rory McEwen’s career was long and varied, intermixing his interest in botanical art and jazz music. This book covers both, though mainly focusing on his art. I particularly like his stark compositions of flowers, how they are placed on backgrounds that are totally void of anything, thus really focusing attention on the minute details he captured and recorded. His technique most often employed watercolor on vellum, a method that employs a very dry application of highly saturated watercolor to its support. However, there is one small section that deviates from his typical technique, its of his exploration of watery watercolors and grasses. These images really capture my imagination, because of the variety of line and form in these pieces. Some areas of the watercolors were allowed to bloom and blossom, creating fuzzy and soft edges, and then there were areas of rigorous precision and edge, much like his more typical work. This is not specifically an art book, however I believe it is an essential read if you strive to improve your craft and want to become a better artist. A few years ago I learned about the idea of “deliberate practice” by reading Cal Newport’s blog StudyHacks. I immediately began applying some of the ideas of deliberate practice to my daily studio habits and within months began to see the results in my paintings. 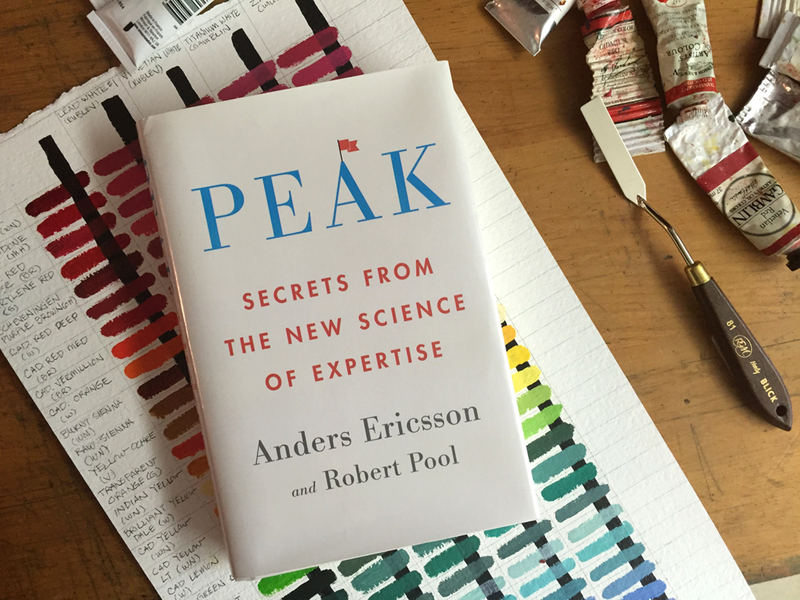 When I found out that the father of deliberate practice, Anders Ericsson, was publishing a new book for a wider audience rather than his academic book on excellence, I preordered it and then devoured it. Instead of waxing poetic about this book, I will share some my own notes from the book. Learning is about developing one’s potential, not as a way to reach your innate potential. So by deliberate practice, one can learn how to expand and grow your expertise. Gaining expertise is made up of: 1. Improving one’s mental processes (even the mind-body coordination) 2. Long-term dedication to the process, 10+ years of purposeful practice. (Purposeful practice is slightly different than deliberate practice, but you need to get comfortable with completing purposeful practice before you can tackle deliberate practice as it requires higher levels of concentration and effort.) All effective deliberate practice techniques involve: 1. Asking what works and what doesn’t in driving changes in the body and brain. 2. And to keep working to shifting these practice sessions outside our comfort zone. DELIBERATE PRACTICE is something more than purposeful practice! Deliberate practice is about harnessing adaptability in yourself. . Humans are adaptable, but the body craves homeostasis, so you have to challenge yourself . By always striving for just outside your comfort zone you change the mind and build your own potential, just be careful about pushing too far – risk of injury occurs then. Q. What is a mental representation in relation to deliberate practice? A. a mental representation is the mental structure that corresponds to an object, an idea, a collection of information, or anything else, concrete or abstract, that the brain is thinking about. Much of deliberate practice involves developing ever more efficient mental representations that can help you in the activity you are practicing. ***the symbiotic character of deliberate practice and mental representations*** The more effective the mental representations are, the better performance will be. Mental representations don’t just result in learning a new skill, they can also help us learn. Honing a skill improves our mental representations, and mental representations help hone the skill. The main purpose of deliberate practice is to develop effective mental representations and as you progress MRs play a key role in deliberate practice, because as one does deliberate practice the mental representations become better, making for improved performance. PRINCIPLES OF DELIBERATE PRACTICE (DP): 1. DP develops skills that other people have already figured out how to do. The practice regime is designed by a teacher and overseen by them. 2. DP takes you outside of your comfort zone, it is not enjoyable and asks for near-maximal effort. 3. DP involves well-defined, specific goals and often focused on a target performance. 4. DP requires a person’s full attention. Concentration and focus on the specific goal must be maintained throughout each session. 5. DP involves feedback and adjustments and efforts as a result of the feedback. This self-monitoring of actions requires effective mental representations. 6. DP both produces and depends on effective mental representations. MRs make it possible to monitor how one is doing, both in practice and in actual performances. 7. DP involves building and or modifying previously acquired skills by focusing on particular aspects of those skills and working to improve them specifically. These notes are just the tip of the iceberg, the book is full of ways to apply deliberate practice methods into your life. If you are curious to learn more, I want to encourage you to purchase a copy of this book and to find ways on how you can improve your skills as an artist. Since reading this book in April 2016, I have been inspired to up my game as an artist and to find ways to better understand what I do as an artist and how to better express my ideas. In this blog post I am going to cover a big subject about why I feel it is important to read, study, and reflect on a daily basis. Implementing this habit has taken me over a year to figure out. If you are interested in some of the back-of-house practices I use to keep inspired, please read on. Last year (2014), my dear friend, Suzanne Lago Arthur, gave me three books that began to change my daily habits as a creative professional. Each book motivated me to reconsider how I organized my days, weeks, and longer term goals. Manage Your Day-to-Day, was helpful in realizing I needed to make a change. It is full of essays that motivated me to seek out solutions of productivity and organization. Armed with the goal to seek some solutions, I was influenced by the thoughtful and habit-forming ideas of the The Accidental Creative and Die Empty that helped me really turn around my practices. Initially, I focused on the exercises that helped me define a vision for my art career, and then I began to implement ways to accomplish it, which led me to establish my 2015 new year’s resolutions. In the The Accidental Creative, the creative rhythm is broken down into discernible categories, and in going through the book and looking at my life in 2014, I realized I had focus (I am a floral still-life painter who paints from life in natural light) but I was seriously lacking in energy (I was sleep deprived and suffering from constant low-level asthma attacks) and stimuli (I had not read a serious art book since Naomi was born in 2011). So going into 2015, I resolved to re-structure my creative rhythm and feed it as well. The main take away from the book Die Empty was that I needed to find a way to step out of my comfort zone and to daily take time to recharge and refocus my efforts. Staring this year (2015) I have made an effort to develop a morning ritual, and in the last eight months I have tried different times and focus activities, which would typically falter after 3-6 weeks. Each time I included time for reading and note taking, but my note taking method kept failing to engage until I came across this blog post about creating a commonplace book system using index cards. Previously my morning ritual would fail because I would get discouraged. My method of taking notes has always been to put them in a bound notebook, but this gets difficult because I like to jump around on the books I am reading and I like keeping my notes in one place. Using the index cards and dividing my notes into a series of topics and subcategories, I have been able to organize the ideas and thoughts I read every morning during my morning ritual. My ritual as of this moment in time is this: wake up, make a pot of tea, sit and reflect for the time that my tea steeps, pour a cup of tea and dive into my reading for the day. I spend about 30-60 minutes reading and taking notes before Naomi wakes up. And before I get out of bed, I also take 5-10 minutes to think about my day in chunks of time, mapping out what I can reasonably accomplish. 1. Harold Speed’s books, the Practice and Science of Drawing, and Oil Painting Techniques. This is the third time I am reading them and this time I feel like I am capturing the big ideas in a way that I can quickly review my thoughts and important points. 2. Philosophies of Art and Beauty: Selected Readings in Aesthetics from Plato to Heidegger. I want to get very grounded in the classical and humanist views of art, because I am a representational artist and I value the world view of classical and renaissance artists, I want to understand the philosophies that inspired them. 3. Writing To Learn by William Zinsser. I am fascinated with the idea of how writing can help you learn a subject in greater depth than just reading. My thought is that this book may improve my note taking skills some more. Having a morning ritual has energized my attitude towards my painting; I am exploring new ideas and expanding my understanding about the how and why I create art. This is why I believe it is important to find time for study and reflection in your daily life. Sorolla is the artist I turn to when I want color and brushwork inspiration. And this book delivers. "The Return from Fishing" is one of my favorites because of its large abstract shapes of positive and negative spaces, this painting was exhibited in the Salon de Paris and is a shining example of his work. However, for me it is Sorolla's ability to capture the daily and ordinary activities of life that makes his work so remarkable. I am inspired by his ability to weave color and emotion into his paintings. 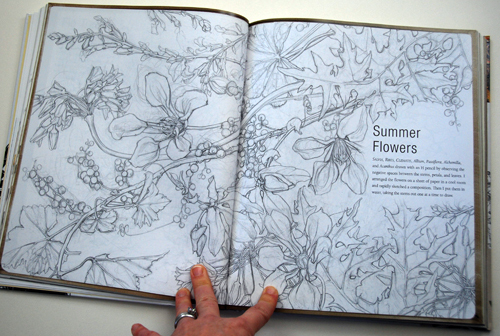 A few weeks ago I shared The Artist’s Sketchbook by Sarah Simblet, and now I want to share her tour de force on botanical art. Personally, I love meticulous and detailed art, the more subtle nuance to zero in on and observe, the better!!! So when a friend introduced me to this book, I immediately asked to borrow her copy, and when I returned it to her, I bought my own. I remember the first year I owned this book, it was always on my nightstand and I would often read through it during my morning cup of tea in bed… oh, those were the days when I could slowly wake up and contemplate art in a slow and relaxed manner. Now I have to schedule time to read, often when Naomi is in preschool, or in waiting rooms and such… I am forever toting an extra bag full of art books around for those stolen moments. But never mind all that, this is a GREAT book, and now for the details that make it so wonderful! This book is also really helpful in teaching the more scientific aspects of botany. I admit, I skimmed these parts... the drawings on these pages are still wonderful. Her is an example of one of the drawing lessons in the book. 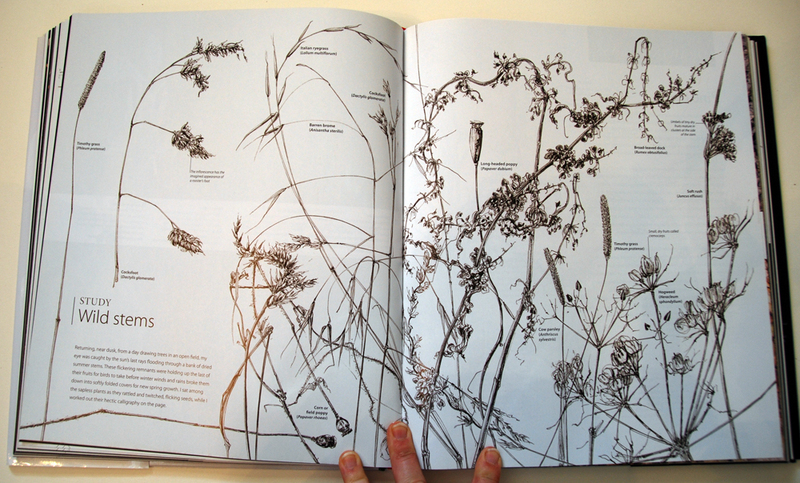 The break down of parts, identifying the anatomy of each plant is so full of detail and so beautifully illustrated. Another aspect I love about this book is how beautifully each page is composed, the images and text are thoughtfully organized. And here is a close up of one of her drawings, you can click on each image to enlarge it to study it more. This book is very well organized and covers the gamut, I love how it breaks down the subject and also how each chapter has at least one lesson on how to draw such meticulous drawings. In the summer of 1998 I picked up an interesting book while traveling, “How Proust Can Change Your Life”. At the time, I was in the middle of getting a Master’s in Architecture degree and had no idea that in a little over ten years I would chuck that career away to focus solely on creating fine art. However in all that time, I never forgot the chapter “How to Open Your Eyes” in this book about Proust. In this chapter Alain de Botton identifies an essay started by Proust where Proust uses the art of Chardin as a foil that shakes his protagonist out of despondency with his life by opening his eyes and encouraging him to take a second look, thus finding beauty and a level of happiness in his life. At the time (1998) I had minimal understanding of the art of still life. Though since taking my first oil painting class in 2006, I have embraced the art of the still life and how it enhances my perception of the world. 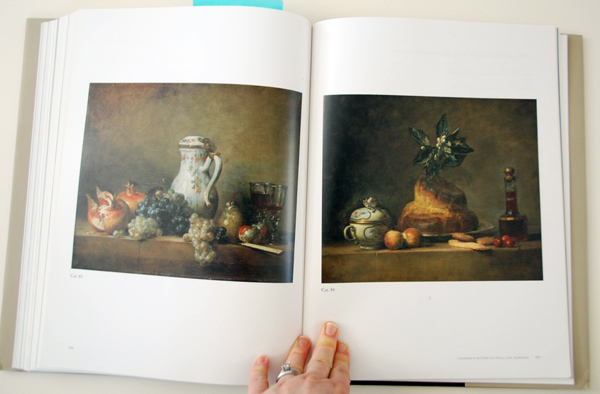 So I think it is only natural to share this monograph of Chardin as a “favorite art book”. It really is a piece de resistance, when it comes to sharing all that is special and great about the simple middle-class scenes Chardin depicted in the 18th Century. 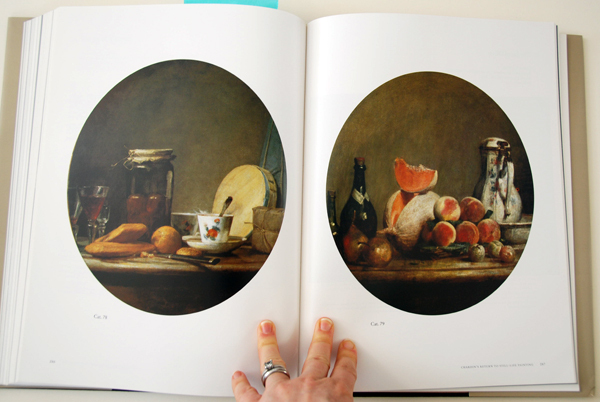 There is an interesting essay at the beginning of the book that shows some photos of the still-life objects depicted in Chardin’s paintings. I especially love seeing this because I am always interested in how other artists depict and maybe simplify decorative pieces. The color plates are good in size and clear. Most every painting has a nice long description. Really, this is a great book to keep in your library if you are interested in still life and the art of enhancing the beauty found in simple things. Today’s favorite art book is all about the power of sketching and how by improving your drawing skills, you improve all other skills related to being an artist. This book is chocker-block full of great advice and covers the gamut of media one can use when sketching. The other compelling aspect of this book is that Sarah Simblet, is the artist that created most of the examples in this book. Her ability to use the various mediums and acuity of skill is an inspiration. In many ways, when I am out sketching, I try to incorporate her technique into my own work. I especially love how she is able to convey the texture of any given object she is drawing. And her ability to fill a page. Sarah Simblet is masterful in how she can shift from loose gestural drawing to the more precise and technically correct rendering. And with each medium covered, she then goes on to demonstrate how to use them when out sketching. 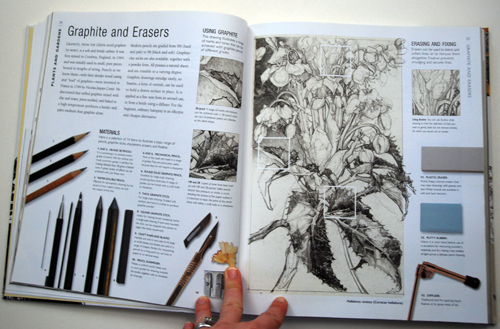 This really is a great book full of eye-candy and lots of inspiration to get out there and draw! So many books talk about painting, but so few really focus on the art of drawing. This is one of my favorites, especially as it has so many beautiful examples to gaze at and if you are ambitious, copy. Another aspect of this book that I love is all the thoughtful text that supports Sherrie McGraw's ideas about representational art. She presents her ideas so well, and every time I open this book and begin reading a section, I come away wiser and energized to apply what I have just learned. When I was still an architect, the majority of my focus in art was the figurative genre. This is because most of the classes I took then were figurative, and to me there is nothing more challenging or rewarding than drawing the human form and capturing a modicum of likeness and accuracy. And being the diver that I am, when I was on my own I would take time to practice drawing the human form by copying out of books, and one of my favorite books to copy from was Vanderpoel’s The Human Figure. So this summer when I needed to bone up on facial features again, I returned to copying from this book. But instead of using charcoal or graphite, I used oil paint. I switched my practice to oil paint because when you are painting, you are using masses to create form, where when you are drawing, you typically rely on contour and line to create form, and I wanted to practice my paint handling at the same time as I was practicing the human form. Here are some photos of how I used this book to practice. Using a limited palette of titanium white, burnt sienna and ultramarine blue, I would copy out each small drawing that graces the margins of this book. These were all fast studies, I would set a timer for thirty minutes and try to complete each page of images in that time frame. The goal was to quickly discern the important shapes and try to capture it with speed and accuracy. Nothing too precious, in fact I would take a photo of each session with my iphone and then wipe the studies down and start over. The text is extremely helpful in reinforcing what you learn from the act of copying out. So I encourage you to read each chapter at the same time you are copying the images. I fell in love with the variety of still-life examples gathered in one place. This book is a nice survey of the variety of styles and interpretations of still life being utilized by contemporary artists, the book is a little old, but it does not seem trapped in its era. If you want to explore this genre more, this is a gem to keep in your library for reference and inspiration. If you are a Facebook friend, you may have noticed all the Van Gogh paintings I have been sharing on my feed. This is because I have become fascinated with Van Gogh’s mark making ever since I was commissioned to copy the painting of Roses by Vincent Van Gogh at the NGA. Being primarily an artist that favors a highly rendered finish with a lot of emphasis on the nuanced transitions in my own work, I get mesmerized by the thick and choppy paint handling Van Gogh favored. I am boggled by his ability to express three dimensional form with stark transitions and minimal modeling. As a result, I have been devouring his work lately, online and in books. So I was especially happy to stumble upon these two books on his paintings of gardens and trees at the NGA bookstore. In Vincent's Trees: Paintings and Drawings by Van Gogh , the focus of the book is all about how he depicted trees throughout his art career. The book is broken down into chapters of his life and what I find remarkable is how he employed trees in his work to define distance in the landscape. By emphasizing the diminishing size of the trees, he was quickly able to convey a sense of distance. It was in this book that I also realized how throughout his career he would paint orchards. They are a reoccurring theme in his work. In the Dutch Trees section, I feel as if there is an overpowering sense of loneliness while in his paintings from Provence, the trees seem to always be flowering, like this painting above. There is a whimsy in the Provencal trees that the Dutch trees lack. Because I am fascinated with how Van Gogh interpreted the world around him, I especially appreciate the examples that show how he would capture the scene in a pen and ink drawing and then go on to paint it with oil. He kept the hatchmarks in the drawings as much as he did in his paintings. Until getting this book on his depictions of trees, I never realized how he well he used them to frame and define the center of interest in his work. His skies will always be remembered, but he often framed or emphasized the sky by trees that were included into his work. In the book, Vincent's Gardens: Paintings and Drawings by Van Gogh , I was fascinated to see how he went about capturing the variety of green space he observed. On the table of contents spread, you are introduced to a busy composition where you, the viewer, are peering in through an allee of trees. It is early spring, so the trees are still somewhat bare, but the cultivated plots beyond are beginning to awake. This is where Van Gogh's skill of creating a believable environment with such direct marks boggles my mind. Color, brushstroke direction, and paint texture all come together in a compelling way. To me his ability to draw and paint are fascinating. I am riveted how he is able to make a meadow of different grasses so interesting. Whether Van Gogh was working with oils, watercolors, or pen and ink, the interest he had in growing plants is evident. This pen and ink drawing of a fountain has got to be my most favorite drawing of his in these two books, I am enthralled by his use of contour and hatch marks to convey the stone basin, the craggy feeling of the trees and their bark, and then how he uses watered down ink to draw in the background structures. Both books are full of eye candy and inspiration. Today, I want to share three books that all focus on Monet’s life and style of living. 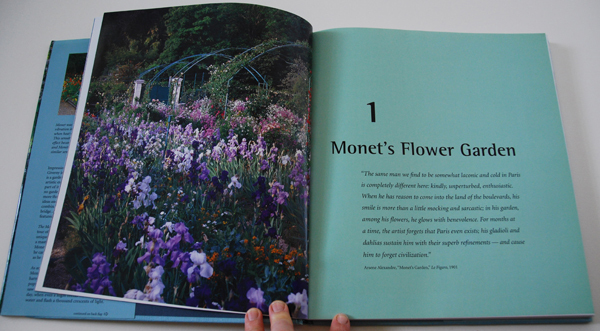 Elizabeth Murray is a gardener and photographer, and she fills her book with beautiful photographs of Giverny. I particularly like how she shares all seasons of being at Giverny, not just the height of the growing season. 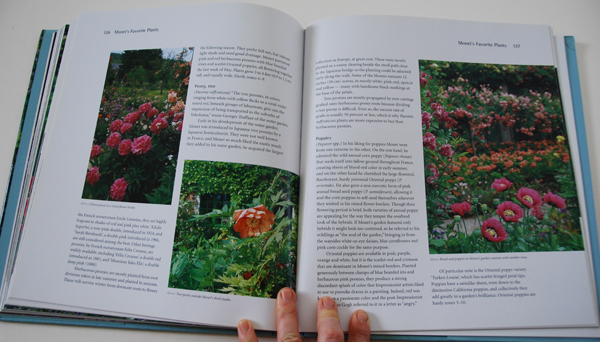 And at the end of the book, she has these lovely garden plans so if you are so inclined, you too can capture some of the beauty of Giverny in your own garden... I have found these to be helpful as I planned for this year's garden, but I must admit I do not know if I would ever implement the entirety of these plans. But they are great jumping off points. 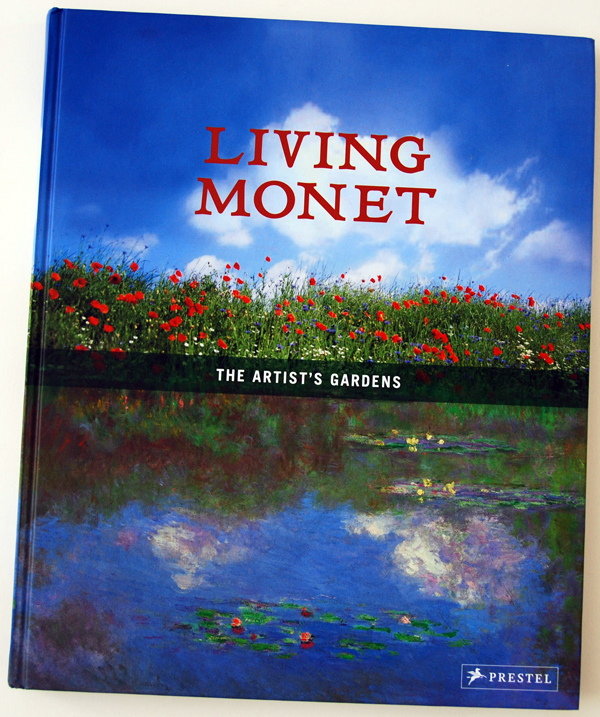 Okay, it was this book that impacted me the most this year… I was struck by how Monet really built the perfect environment for his artistic vision. He purchased this house, and immediately made improvements on it, like converting the attached barn into his studio, that doubled as a parlor at times. He was very decided in how he wanted to decorate his house and even went as far as designing the fine china that was used when special guests were present. Monet, designed his gardens so he could paint in them and the house he lived his days in. I admire his ability to create the world that was a constant inspiration for his art. I so envy his waterlily studio, especially the translucent glass ceiling. Talk about always having a consistent and intense light source! I have been so fixated on my garden this year, and these books have been a great source to help develop my plans for this growing season and for the next few years as well. Every once and a while I am inspired to go outside and paint the landscape. By nature, I love the outdoors and being that I focus 90% of my time on still-life subjects, painting from life in natural light, I sometimes realize that on the most beautiful days, I spend the entire day inside! So when this seems to be my existence for several weeks on end, I go outside and paint. However being a “booky” kind of person, I also like to read and research a topic extensively because I believe my skills can be improved by a little bit of self propelled study… Then a good artist friend, who mainly paints en plein air recommended this book, so I snapped it up. It is a well organized book for the beginner and intermediate artist interested in landscape. The first part of the book is dedicated to housekeeping topics like selecting your easel and palette and what medium to use when outside. There is a ton of handy advice in this section. The chapter on Simplification and Massing is especially helpful, with good instruction and varied examples. I find it challenging to simplify the landscape, so any clear and thoughtful explanation on this topic is always welcome. The chapter on Composition was also helpful. Being that composition is probably the single most important aspect of any piece of art, I always enjoy learning more about how I can improve my understanding of this very wide and diverse topic. In addition to the all the information stored in this book, it is also full of great images from dozens of different artists. Two weeks ago, I had a pleasure to visit the Sackler Museum to see an exceptional exhibition on Whistler and his work depicting the Thames River in London. The exhibition is amazing, and I could not help but come away with the exhibition catalog, because it includes all the images in great detail, and also has two informative esseys. The book also has a good summary of etching and drypoint. And this is helpful because as many of the images in the exhibition are prints. Personally, I am interested in etching and drypoint, and I love books that have great reproductions that capture all the small and subtle effects of the original prints. I just love Whistler’s skill at describing the working side of the Thames with such feeling. And the paintings in the exhibition are the more soulful and moody, incorporating scenes of “modern” London of the late 19th century. Elegance and Refinement: The Still-Life Paintings of Willem van Aelst by Tanya Paul, James Clifton, Julie Berger Hochstrasser, and Arthur K. Wheelock Jr. 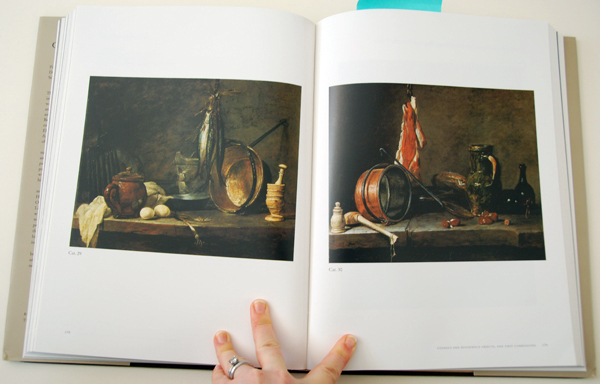 This book is an exhibition catalog, however if you were unable to see the exhibit, like me, this book is still a valuable reference if you are a lover of Dutch still-life paintings. And if you happen to paint with oils and strive to capture the beauty found in van Aelst’s work, the essay on his technique is invaluable. This essay was written as if it was meant to instruct artists on how to emulate the highly refined paint application methods van Aelst employed. I only wish I had had this advice when I began my de Heem copy in 2010. I loved the written explanations that were supported with photos. Another aspect of this book that I find invaluable are the descriptions of each painting. I love learning about each painting with a little more depth than just what a detail photo will impart. For me, sometimes the importance of something is only absorbed and learned if I read about it first, and then I search for it in the image of the painting. Even the back of the book is beautiful and full of detail. Henry Potthast is a new artist to me. I found this book in the NGA bookstore and being that I had been pondering about improving my sketching skills of Naomi when she it out playing, this book happened to be just the right kind of inspiration. Now back to why this book inspired me to purchase it and bring it home. First off, the book has a great essay on Henry Potthast’s painting training and techniques he employed, that are supported with several images from his sketchbooks. Then in the catalogue, instead of just having finished images, there is a collection of his working sketches alongside his completed paintings, with helpful descriptive annotations. I learn new painting techniques from the written word as much as I do from analyzing an image. So this book is a perfect balance for me. What is also helpful with this book is the comparisons you get to employ when analyzing Potthast's work, you can look at his working sketches, in pencil, watercolor, or oil pastel/crayon, and then see how he assimilated the initial idea and refined it to express more specifically what was special about the moment. This is why I love drawing and painting so much, because as the artist, you can shift reality some to better define what is important. This is an excellent book for beginning and intermediate level artists who are interested in learning more about painting in the direct method, or alla prima. I found this book well organized and thoughtful in how it presented information. The first part is dedicated to basic materials, and the second part to color. However, it is the last two sections of the book that really make this a good reference book to own. Part Three is dedicated to explaining and teaching the different techniques associated with painting in a direct manner. Part four of the book explores the different genres of painting, and how the alla prima method of painting might be applied to them. Its a fascinating book with a lot of different artists contributing to the book, thus also providing a glimpse at all the different ways artists can apply the direct method of painting. As I am copying The Artist’s Garden at Vétheuil by Claude Monet right now at the NGA, and that it is April, when I can begin planting my annuals here in Northern Virginia without fear of a hard frost, it only seemed fitting to review an interesting book about Monet and his gardens. This book is full of his lesser known paintings paired with photos (historic and contemporary) of his gardens. 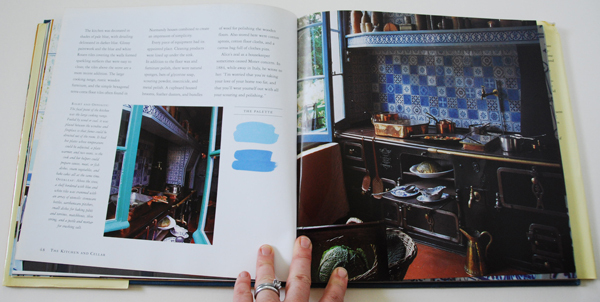 With a main emphasis on his last house and garden in Giverny. Each section starts with a few pages dedicated to just that topic, and with a write up about how and why the subject matter symbolizes certain ideas and then a few paintings are analyzed, showing how the artist used the symbolism to support the meaning of his painting. After the general review of the category, specific examples are then further explained. In the flowers section alone, Lily of the Valley, Cyclemen, Jasmine, Tulips, and many others are covered. And this is how each section is organized. This is a great reference book to have around. If I am noodling on a still-life composition idea and I want to make it a more meaningful piece, I will sometimes read through this book in the evening to make sure my ideas are correctly based.